I was honored to know Mink when I worked on Capitol Hill in the early ’90s. #RaceTogether turns out to be like some phony white nostalgia capable of “Mad Men’s” Don Draper, who still insists on seeing the world in black and whiter. I know, I was initially taken by the idea, because I’ve been a victim of the racial “micro-aggressions” that unconsciously occur and saw nothing wrong with a little race conversation. 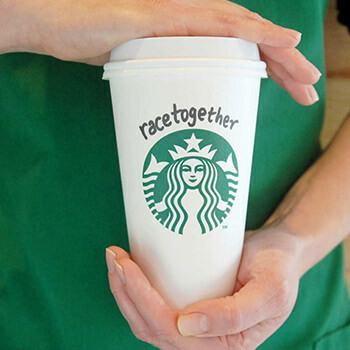 But it turns out #RaceTogether is really just more race double talk. I saw it fifteen years ago when I was part of a small corporate dinner with Starbucks officials, including Howard Schultz. There were less than 20 people. And it was practically all white–at least the people who talked and were perceived to have any real power. I don’t think Schultz even noticed me. Or will remember I was there. That’s how much being at the table can mean. Maybe he thought I was a waiter. Still, when I first heard about Schultz’ #RaceTogether campaign, I was willing to give him points for earnestness. Any time corporations try to act like good citizens, I think it should be applauded. At first, I found the backlash to the whole campaign kick-off pretty surprising. The left and right can’t get together on affirmative action, but it sure found common ground on the subject of Starbucks talking about race. I may have wanted my race conversation venti, but most people just want their coffee regular, to go. And now I’m jumping over to your side, you coffee grumps. Thank goodness Starbucks has stopped writing that darn hashtag on their cups. If you’ll recall, the whole #RaceTogether effort was timed to arrive with an insert included in last weekend’s USA Today. If you saw that insert, then you know Starbucks doesn’t have a clue when it comes to Diversity 2.0. I was astonished at how black and white it all was. From the cover of the eight-page insert to all its content, Starbucks and its partner USA Today are still thinking like it’s 1960. And yet they know things have changed. On page three, a full page graphic shows off USA Today‘s Diversity Index. The 1960 map is almost all white, even California. And the nations’ index number is a low 20. 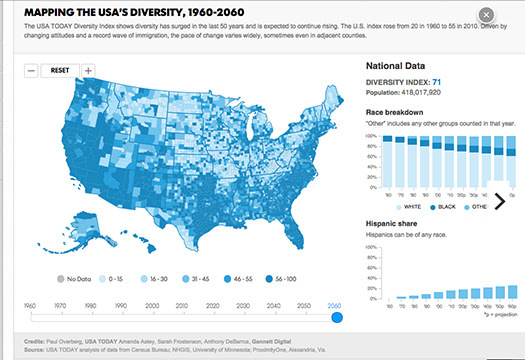 By 2010, the map is full of different shades of black and gray among white in America, especially California, and the index number has more than doubled to 55. Then it shows 2060, where the national index number is 71 and the map is an explosion of all different shades. But it’s still in black and white, the theme of the insert and the mindset of the entire campaign. By page 4, the first faces of real people appear. Of six people pictured, there’s two Latinos, three African Americans, 1 white male. I know quotas are illegal. But not in news stories. Where’s the Asian American? Native American? The insert also has an interesting report on an “unconscious bias experiment,” in which researchers drafted a legal memo from an associate named “Thomas Meyer.” The memo purposefully contained grammar and analysis errors. Then it was sent to 60 partners of different firms, but “Meyer” was identified as African American to half of the firms. The other half were told he was white. Interesting. But why the name Meyer? Were the researchers listening to Lenny Kravitz CDs? Consider a world that has spawned Robert E. Lee, a white man who commanded the South, Bobby Lee, a funny Asian American comedian, and Carlos Lee, a black Hispanic retired millionaire baseball player. Now that’s a real complex gene pool. What kind of a reactions would any Mr. Lee get in 2015? Another section called “True or False” tests assumptions. And Asians are mentioned in one of eight questions: “Asians recently surpassed Latinos as the fastest growing group of new immigrants to the United States.” True or False. See the answer on my blog, www.amok.com. But the real clincher for me that Starbucks was mired in yesterday’s coffee grounds was the so-called “Path to Progress,” a timeline of race highlights that is incomplete at best. Asian American highlights are there, such as 1903’s Japanese-Mexican Labor Association. But why mention that and exclude Cesar Chavez and Larry Itliong’s Mexican-Filipino effort in the far more significant United Farm Workers struggles in the ’60s? The Immigration Act of 1924 that ended Asian immigration to the U.S. is mentioned, as are subsequent immigration changes in 1965. But there’s no mention of U.S. vs. Wong Kim Ark, the landmark 1898 Supreme Court case, still being used today to uphold your birthright to U.S. citizenship when born on American soil. Wong Kim Ark was born in San Francisco’s Chinatown in 1871, went to China, and then was denied re-entry to the U.S. The victory in that case is still relevant today. The timeline mentions how the U.S. Department of He alth, Education and Welfare decided in 1970 that students cannot be denied access to education because of an inability to speak English. Great. So why not also mention Lau vs. Nichols, the 1974 case in which the Supreme Court gave a real victory to bilingual education? Of course, the incarceration of Japanese Americans in World War II is mentioned. But nothing about Fred Korematsu’s successful challenge of Executive Order 9066? So come on, where’s Patsy? 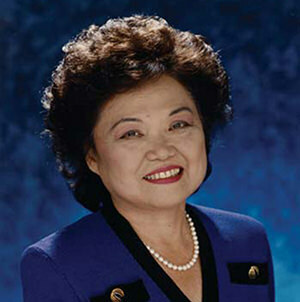 I will grant them leaving out Connie Chung, first Asian American anchorwoman on a network evening newscast. But leaving out Patsy Mink and putting in Vanessa Williams, the first African American Miss America? And no mention of Shirley Chisholm? It’s a throwback to the ’50s when exclusion was the accepted rule. If Starbucks wants to acknowledge the news of the day–Ferguson and the black/white divide accentuated by law enforcement–then it should do that the way corporations can. Open more stores there. Hire more African Americans who can’t afford to buy Starbucks products. Pump money into the community so they can. That would be far better than making it sound like Starbucks is on some mission of inclusiveness and then conveniently leaving us all out.